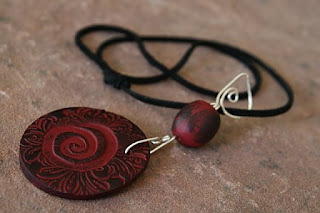 Sterling Silver brings together this handcrafted Polymer Clay piece into a funky and fun everyday necklace. Wear it with the leather or your favorite chain! I have worked with the Sunshine Breast Cancer study at the University of Colorado. Many sterling silver pendants have gone out monthly for a good cause! LuQu Designs are Simply You. Each one is hand crafted and unique. Mothers, I'd love to create rings, necklaces or bracelets featuring your childrens' birthstones. Kids, you know your mother wants one! Maybe you need just the right necklace to set off that LBD or a piece that rocks your everyday-wear. Choose your clasp or colors. Not just closures, the intricate swirls and curves of my clasps often can be the feature. Let's design you a signature style. Me... Jewelry Designer, Mom, Wife, Gymnastics Coach, Snowboarder! LuQu Designs embrace the natural qualities of the materials they employ. More than jewelry, each original piece blends the subtle complexities of silver, gem, bead or stone into a simple, wearable object of art. Inspiration for LuQu Designs comes in many ways: art, nature and fun are some examples. I am most inspired by my husband Chad, son Quinn (Qu) and daughter Lucy (Lu), who continuously bring my creativity to new levels.